Martis, 14 die Decembris, 1680. Privilege- Misconduct of an Under Sheriff. Privilege- Absconding of a person. Complaint against Sir R. Peyton. 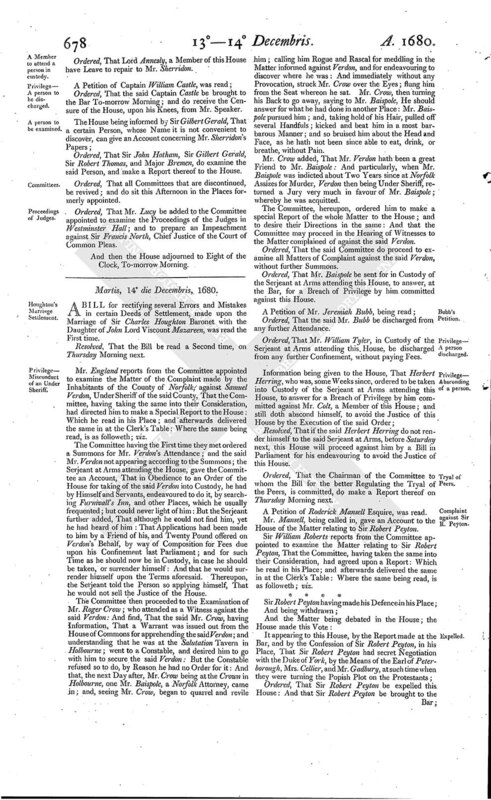 A BILL for rectifying several Errors and Mistakes in certain Deeds of Settlement, made upon the Marriage of Sir Charles Houghton Baronet with the Daughter of John Lord Viscount Mazareen, was read the First time. Resolved, That the Bill be read a Second time, on Thursday Morning next. Mr. England reports from the Committee appointed to examine the Matter of the Complaint made by the Inhabitants of the County of Norfolk, against Samuel Verdon, Under Sheriff of the said County, That the Committee, having taking the same into their Consideration, had directed him to make a Special Report to the House: Which he read in his Place; and afterwards delivered the same in at the Clerk's Table: Where the same being read, is as followeth; viz. The Committee having the First time they met ordered a Summons for Mr. Verdon's Attendance; and the said Mr. Verdon not appearing according to the Summons; the Serjeant at Arms attending the House, gave the Committee an Account, That in Obedience to an Order of the House for taking of the said Verdon into Custody, he had by Himself and Servants, endeavoured to do it, by searching Furnivall's Inn, and other Places, which he usually frequented; but could never light of him: But the Serjeant further added, That although he could not find him, yet he had heard of him: That Applications had been made to him by a Friend of his, and Twenty Pound offered on Verdon's Behalf, by way of Composition for Fees due upon his Confinement last Parliament; and for such Time as he should now be in Custody, in case he should be taken, or surrender himself: And that he would surrender himself upon the Terms aforesaid. Thereupon, the Serjeant told the Person so applying himself, That he would not sell the Justice of the House. The Committee then proceeded to the Examination of Mr. Roger Crow; who attended as a Witness against the said Verdon: And find, That the said Mr. Crow, having Information, That a Warrant was issued out from the House of Commons for apprehending the said Verdon; and understanding that he was at the Salutation Tavern in Holbourne; went to a Constable, and desired him to go with him to secure the said Verdon: But the Constable refused so to do, by Reason he had no Order for it: And that, the next Day after, Mr. Crow being at the Crown in Holbourne, one Mr. Baispole, a Norfolk Attorney, came in; and, seeing Mr. Crow, began to quarrel and revile him; calling him Rogue and Rascal for meddling in the Matter informed against Verdon, and for endeavouring to discover where he was: And immediately without any Provocation, struck Mr. Crow over the Eyes; flung him from the Seat whereon he sat. Mr. Crow, then turning his Back to go away, saying to Mr. Baispole, He should answer for what he had done in another Place: Mr. Baispole pursued him; and, taking hold of his Hair, pulled off several Handfuls; kicked and beat him in a most barbarous Manner; and so bruised him about the Head and Face, as he hath not been since able to eat, drink, or breathe, without Pain. Mr. Crow added, That Mr. Verdon hath been a great Friend to Mr. Baispole: And particularly, when Mr. Baispole was indicted about Two Years since at Norfolk Assizes for Murder, Verdon then being Under Sheriff, returned a Jury very much in favour of Mr. Baispole; whereby he was acquitted. The Committee, hereupon, ordered him to make a special Report of the whole Matter to the House; and to desire their Directions in the same: And that the Committee may proceed in the Hearing of Witnesses to the Matter complained of against the said Verdon. Ordered, That the said Committee do proceed to examine all Matters of Complaint against the said Verdon, without further Summons. Ordered, That Mr. Baispole be sent for in Custody of the Serjeant at Arms attending this House, to answer, at the Bar, for a Breach of Privilege by him committed against this House. Ordered, That the said Mr. Bubb be discharged from any further Attendance. Ordered, That Mr. William Tyler, in Custody of the Serjeant at Arms attending this House, be discharged from any further Confinement, without paying Fees. Resolved, That if the said Herbert Herring do not render himself to the said Serjeant at Arms, before Saturday next, this House will proceed against him by a Bill in Parliament for his endeavouring to avoid the Justice of this House. Ordered, That the Chairman of the Committee to whom the Bill for the better Regulating the Tryal of the Peers, is committed, do make a Report thereof on Thursday Morning next. 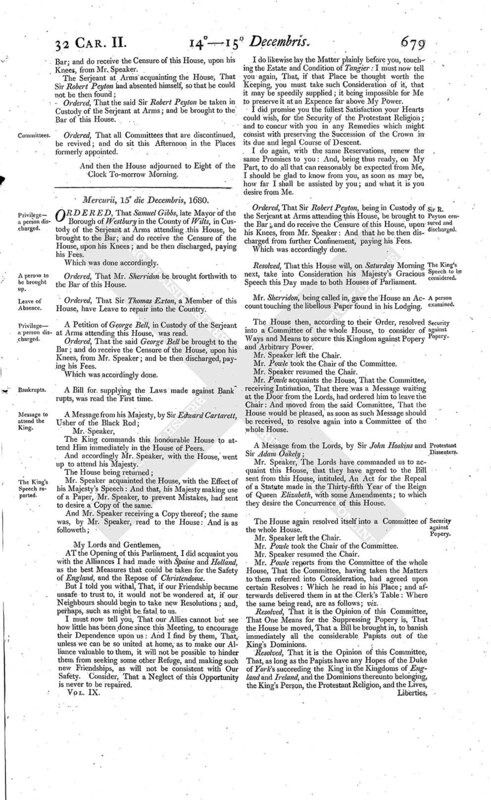 A Petition of Roderick Mansell Esquire, was read. Mr. Mansell, being called in, gave an Account to the House of the Matter relating to Sir Robert Peyton. Sir William Roberts reports from the Committee appointed to examine the Matter relating to Sir Robert Peyton, That the Committee, having taken the same into their Consideration, had agreed upon a Report: Which he read in his Place; and afterwards delivered the same in at the Clerk's Table: Where the same being read, is as followeth; viz. Ordered, That Sir Robert Peyton be expelled this House: And that Sir Robert Peyton be brought to the Bar; and do receive the Censure of this House, upon his Knees, from Mr. Speaker. Ordered, That the said Sir Robert Peyton be taken in Custody of the Serjeant at Arms; and be brought to the Bar of this House. Ordered, That all Committees that are discontinued, be revived; and do sit this Afternoon in the Places formerly appointed.